We are experiencing what could be called 'the domino effect'. A simple idea to replace a weak step on the stairs ended with us having to replace half the hallway floor. 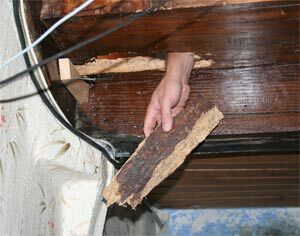 Asking a carpenter to look at a replacing one beam has us contemplating replacing the whole roof! Five of the seven beams under the stairs were broken. They crumbled away in our hands. The stairs had also dropped by several centimeters on one side. There were several rat's nests made from chewed plastic bags, under the beams. We have started the process of creating a bathroom on the first floor. This entailed removing the old floorboards above the back kitchen and the chai (the wine cellar). 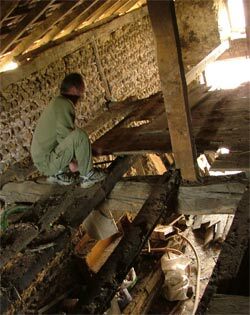 We then discovered that the beams were not in as good a state as we first thought, so we are now going to replace them too. Thankfully, we have Terry Martin and his son Simon to do the dirty work and replace the timber. One good piece of news is that we have discovered why the storage space always smelt so bad. A dead and still decomposing rat was curled up under the floorboards above. 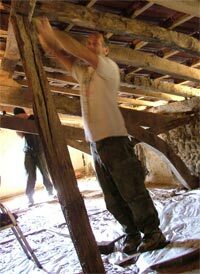 We have also hacked at the softer wood in the beams that have been attacked by the capricorn worms (boktorren). The plan is to tear out all the joists, level the walls below and lay new beams across the whole of the first floor at the back of the house. We will then call in the plumber and electrician to lay in the pipes and cables before closing the floor and starting to build in the bathroom fixtures. Removing the floorboards and replacing the joists between the main beams. 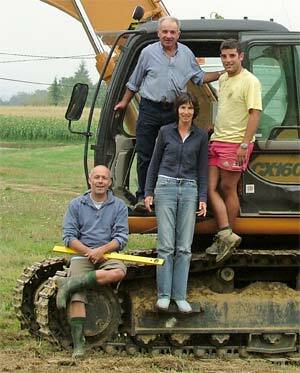 Meanwhile, Mr Nogues finished the drainage and the sanitation around the house. He left the place immaculate and the grass has grown over the now closed trenches. Good job we made photos and notes so that we can find them again in an emergency. Michel Nogues and his assistant Alex did a great job. Merci! A week or so later, his team turned up unannounced, to empty the old septique tank. Caroline dashed to save her herbs but many were sprayed with years of sewage as they washed the terrace down before leaving. 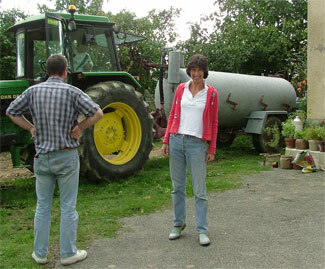 Caroline and our plumber Klaus get a whiff from the old septic tank. Our friends Marco and Marike promised to come help for an afternoon, so long as it wasn't a messy job. 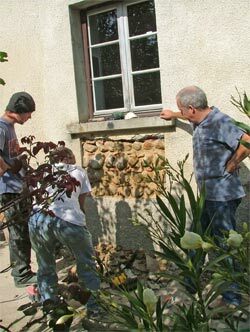 We decided on creating stone steps to the porcherie. The trailer came in handy to collect sand and cement. Marco brought his cement mixer and Caroline started shovelling. We had been gathering stones from the soil during the excavations for the drainage, so used them as the basis for the steps. Caroline and Marco mixing it up. Adding pigment, found in our clay soil, to the cement to give it a natural colour, Marike and Caroline make the finishing touches before a well-earned shower and dinner. The kitchen window to the south has been knocked out and we now have double glass doors which open out onto what will become our terrace. 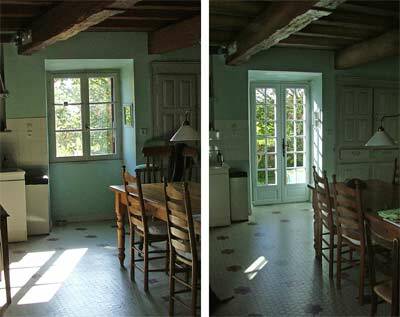 The kitchen window has become a door, but not without it's problems along the way. The reinforced concrete and old stone wall were tough to remove and deposited dust everywhere. Now it takes ten seconds less to walk into the sun. It also looks like it was always there. Out with the old beams and in with the new. 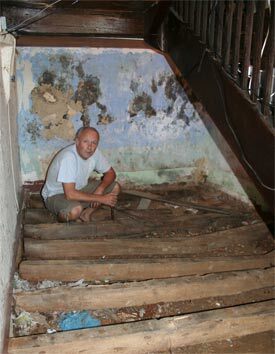 Replacing the floor under the stairs, we found rats' nests and a rather damp soil. Houses here are built on the ground without much in the way of foundations. 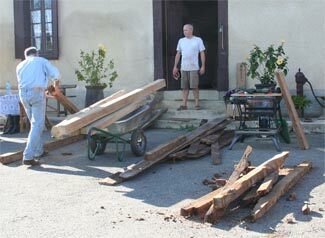 The barns have all sorts of oak beams piled up in them, so we cut them to size, treated them and laid them in. None of the walls are straight or 90 degrees to each other, so it was 'fun' working it all out. Me thinks this step needs replacing too! The stairs and landings are a patchwork of old and even older wood, mostly oak or poplar. While we were at it, we replaced several pieces that were past their prime. 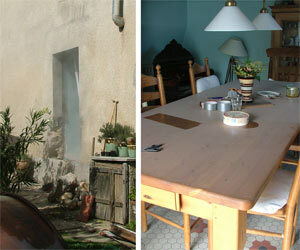 We heard from our local restauranteur that our house is one of the oldest in the village, possibly 300 years old. It explains the hand-cut oak floorboards of differing widths and the stone and earth walls. We are discovering more and more about how and why the house was built the way it was. Less enchanting are the discoveries that many parts of the house are past their 'sell by' date. We are now getting local carpenters to quote on a new roof, not only for the house, but for the barn next to it. Our plan to add a dormer (dakkapel) to the back roof has been rejected by the Mairie, so we will have to make do with velux (sky lights) instead. 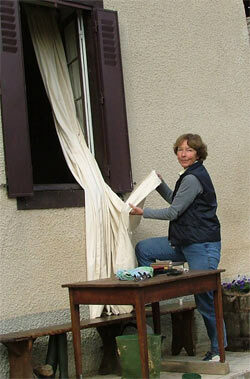 Marianne made the most of the last of the autumn sun, even when fitting our curtains!